The UK is getting all train nostalgic with the now regular trips that can be undertaken being pulled by such iconic engines as the Flying Scotsman, Brighton Belle and now the Tornado. Could we ever see a renaissance of the Puffing Billy and Stephenson’s Rocket I wonder? Almost certainly not, so we will have to satisfy ourselves with viewing these rail pioneers at the Science Museum in London. It is an overwhelming sense of nostalgia that pervades when I get on a train overseas, especially in Eastern Europe or developing countries in Asia, Africa, India, South America or the Middle East. It has nothing to do with steam or Pullman carriages, just the feeling of being thrown back forty years or so to the way it used to be in the West. These used to be commonplace everywhere, but with the progression in digital train diagnostics they are sadly no longer needed in the UK and many other countries. Nowadays, so much as a hint of a problem with any part of the train is instantly relayed to the cab to alert the driver. This is a far cry to the olden days when guys armed with large iron hammers would tap every train wheel for the tell tale sign of a crack. So attuned were these guys that even the merest hint of a crack would be instantly recognised. The good news was that potential danger was averted, the bad news was that it could lead to a serious delay in your journey should the crack deemed to be large enough to necessitate a wheel change or depending where the carriage was situated, a possible jettison situation with passengers then crammed onto what remained of the train. In large swathes of Eastern Europe this ancient art form is still widely practised. Many of the trains in the region have been bought from richer nations that have upgraded their fleet, with locomotives the old diesel fuelled monsters of old. Every station has a mini army of hammer wielding artisans, who descend upon the train as soon as it comes to a halt to tap tap tap, before almost certainly giving the thumbs up to the train guard. As is my wont on such occasions, I smile thinking about the passengers who may never have witnessed such a spectacle before. A mob of scruffy looking men carrying menacing looking hammers approaching the train with assertive purpose. Possible passenger apprehension undoubtedly leads to bewilderment as the men go about their peaceful business. Seriously, I love the fact that there is still a place for such a traditional vocation. I am all for progress, but long live the wheeltapper! It is not only the wheeltappers themselves that I love, but what they represent. Reminders of a bygone age when things were simpler in many ways – pre the digital age and a time when people actually spoke to each other. I get the same feeling when I see oxen drawn ploughs in the field – labour intensive and not overly enjoyable for the workers, but gratifying to see all the same. I just love those old carriage layouts where you used to have a walkway up and down the side of the train with individual compartments to the side of you. Each compartment had its own sliding door and typically you had six or eight seats in each one. For me this evokes memories of Reginald Perrin on his daily commute to London. Bowler hats and umbrellas in the rack, the Times crossword and conversation amongst fellow commuters. Or how about an old Hammer Horror such as Dr Terror’s House of Horrors starring Peter Cushing & Christopher Lee? These compartments are great. When I first went inter-railing in 1987, every train was laid out this way. Oh the luxury of getting a compartment to yourselves. The greatest thing of all was that the seats had a mechanism so that you could slide it forward to join the seat opposite. Six large seats reclined this way made a great double bed and a very comfortable overnight journey without the expense of paying for a couchette. We were lucky on about 40% of those journeys that I undertook in ’87, ’89 & ’92. We had the routine off to a tee. Make a beeline for any empty compartment, spread our belongings out amongst the seats, join them together as soon as the train left the station and for good measure spread a few smelly socks out to ward off any would be compartment sharers. Totally selfish I admit, but when you are impoverished as we were back then, sometimes you just had to improvise to get a decent night’s sleep. Those enemies of the budget inter-railer known as seat reservations often scuppered this cunning plan. An overnight train journey sat bolt upright is not recommended at the best of times. Worse still was the time that my bed on an overnight train in Italy consisted of two tiny fold-down seats in the corridor with my rucksack laid in between them. Having fallen off for the fifth time, I finally gave up and consigned myself to arriving in Venice tired and irritated. Not conducive to two pals being civil to each other, no matter how friendly they were towards each other in normal circumstances! In a previous post I recounted one of my favourite journeys from Paris to Copenhagen in 1992. My two travelling companions paid for a four-berth couchette and shared with two noisy Danes, one of whom for some reason had bagpipes which he insisted on practising into the early hours. I had refused to pay for a berth, but joy of joys I got a whole compartment to myself. I drifted off to a lovely sleep after reading Tess of the Durbervilles and then listening to the Smiths. I arrived in the Danish capital totally refreshed, whilst my buddies were tired, irritable and £15 each down on the deal. For once I had got it right! Happily these types of layout and reclining seats still survive in the likes of Ukraine, Moldova, Romania and Armenia. I do now usually splash out for a couchette on overnighters, but on daytime journeys I invariably seek out an empty carriage, recline and reminisce! So what’s so nostalgic about that, you may ask. You can watch the world go by from any train in the world. True of course, but such is the desire for speed, that this often flashes past in an instant. I do love going on a TGV, AVE or Pendalino and one of my ambitions is to ride both the Bullet Train in Japan and the Maglev in China. However, slower travel also has its merits. Maybe not quite as slow as the 38kmh average train speeds I experienced in Albania, but slow enough to be able to really enjoy the window on the world. I actually totted up all my travels in Eastern Europe – 15,568km at an average speed of 53kmh. This does include a few delays and slower overnight trains, but still generally a leisurely pace. When was the last time that you waved at a group of tea or rice pickers in a field or conversed with local kids through the train window (the type that wonderfully actually open!)? When did you last enjoy being able drink a cup of coffee without fear of scalding yourself? Following the notion that a trip should be about the journey as well as the destination, a slow train is a great way to get there. Whether your pleasure is to read a book, write a journal, do the crossword, play cards, listen to music, converse with fellow passengers or purely to gaze at the unravelling landscapes, a slow train is the perfect companion. No hurry = no worries. You will get there, but in the meantime just enjoy the ride. Two hours late? No problem. Compare this to when a commuter train in London is five minutes late – from cheery acceptance to tutting impatience, from relaxation to stress, from good humour to furrowed brows. In the regions I mentioned at the start of this article, the trains are invariably slow, usually delayed and almost always late arriving. This just adds to their allure for me when on holiday. In another amazing contrast with my homely habits, if I go on a journey longer than two hours in the UK I will be armed with enough food & drink to last me all day and enough throwaway reading material to stock a small newsagent. Contrast that to an eight-hour journey in Asia for example when I will carry a few bananas, a litre of water and a real paperback book. I talk to strangers too, break bread and swap stories. It really is great fun. There are one or two opportunities to travel overnight in the UK. Despite threats at various points for economic reasons the Penzance to Paddington and Kings Cross to Scotland sleepers still run. Both are still on my to do list, but I have undertaken numerous overnight journeys throughout Europe and further afield in Vietnam, Turkey, Indonesia, Thailand/Laos and Georgia/Armenia. My first such journey in a proper couchette was Gallivare to Gothenburg in 1989, whilst my favourite is probably Ankara to Erzurum in Kurdish Turkey in 2013. It is the rigmarole that I love the most though. The anticipation, nay nervousness in wondering how big the space will be or where private berths are not available, imagining who your companions might be or just maybe whether you will be lucky and get the place to yourselves, as we did from Belgrade to Sofia in 2012. Companions have included a mother/daughter/blind cat combination in Georgia, the biggest fib teller I have ever met from Bucharest to Chisinau, a fascinating train engineer thrown together with a talented young cellist in Ukraine and a couple who appeared to be both at least 100 years-old in Vietnam. It is totally in the lap of the gods or perhaps a mischievous train guard. Never ever cross a train guard on an overnight journey. Not if you want a peaceful night’s sleep anyway. They can invent a reason to tap at your door at 4am, or can give you less than pristine bedding, or turn your heating off as it snows outside or fine you for losing a pillowcase (as happened to my travel buddy in Ukraine!). Not overly appealing? It is to me! The late night beer followed by rocking to sleep to the sound and motion of the train is a most wonderful experience in my book. I should be doing the Skopje to Belgrade night time run in September. I cannot wait! Early morning toilet trips brought on by late-night beers are undoubtedly my least favourite parts of an overnighter. Invariably it is a real knack to get to sleep in the first place, having to attune to the bumps of the train tracks below you. You usually start to waken around three, as the need to pee dawns on you. Warm in your little cocoon, you fight the urge for as long as possible before giving up thirty-minutes or so later upon realising that your bladder requirements will preclude further sleep. Luckily you will be wearing socks to keep your feet warm as they would invariably stick out the end of the inadequate bed, but in the pitch black you are unable to locate you shoes. Turning the light on would be terribly bad form and a non-starter if you want to preserve good relations. Having noisily mastered the door lock and latch and briefly woken your lightly snoring roommate, you shuffle off down the corridor to find the grim toilet. In the dim light inside, you will invariably find that some fellow traveller has left you a disgusting calling card as you hold onto the handrail and attempt to at least reduce the offending deposit for the next unlucky visitor. Your socks will now be wet as you flush the turgid concoction onto the tracks below without a moment’s thought for the poor souls who live alongside. Time now to squelch back to your compartment. But hold on, which one was it? In the gloom you are never sure and often try a locked one, before locating the open one next-door, peering in gingerly and hoping not to witness a snoring heap of stranger. Safely back inside and your final challenge, wet socks on or wet socks off? It has to be off. At least now, after a few of these experiences, I always ensure that I know where my boots are for these unpleasant forays into the dark. Something else that is missing from any UK trains that I have travelled on. It is all so quick here – visit the buffet, stop the trolley or have a bacon sarnie served at your seat. Not so overseas. Spanish, Swiss and French trains to name three in Europe have proper sit down bars at which to enjoy a beer or hot meal. Others have full on sit down restaurant cars. When I was growing up there used to be a travel related programme called Whicker’s World. Hosted by English gent Alan Whicker, this usually centred on Alan travelling to far flung places, invariably with a classic train journey featured along the way. Whicker came across as a Thomas Cook type, aristocratic and slightly eccentric and the TV forefather for the likes of Michael Palin and Michael Portillo. I was transfixed as he rode the Orient Express, the Singapore to Bangkok flyer or the Blue Train in South Africa. Alan was generally adorning a tuxedo, sipping champers, tucking into a gourmet meal and joining in piano singalongs. Although this was not to be my cup of tea, the train restaurant car definitely was. My favourites have been on long eastward journeys in Turkey. The sense of going somewhere a bit different, deciphering alien menus and watching the world speed by as you relax over your breakfast, evening meal or beer with nibbles. Just wonderful and not a bow tie in sight! The photo of the table above is from the Dogu Express train in Turkey on the way to Erzurum. My travel companion Hamish is vegetarian, a concept not readily understood on Turkish Rail. His evening meal had consisted of a plastic piece of cheese from the cheeseburger meal chopped up and mixed with the rice from the beef stew meal. It took a lot of pointing and gesticulating to get his chosen meal delivered and even then they gave him a jug of gravy – they obviously felt sorry for the bland dinner they had provided! The above two pictures are taken from the Toros Express train from Ankara to Adana that we took in 2009 as we made our way to Aleppo in Syria. The first shows me possibly the most content I could ever be – a beer in a restaurant car on an overnight train, whilst reading the Lonely Planet guidebook. Breakfast Special Turkey Train Style! The second one is breakfast time. We had the ‘breakfast special’ which consisted of a hard-boiled egg, a bread roll, some rock like butter, some Greek salad, a slice of spam, a jam portion and unlimited tea or coffee with powdered milk. It felt like a banquet, despite the fact that I snapped my plastic knife into pieces trying to spread the butter! 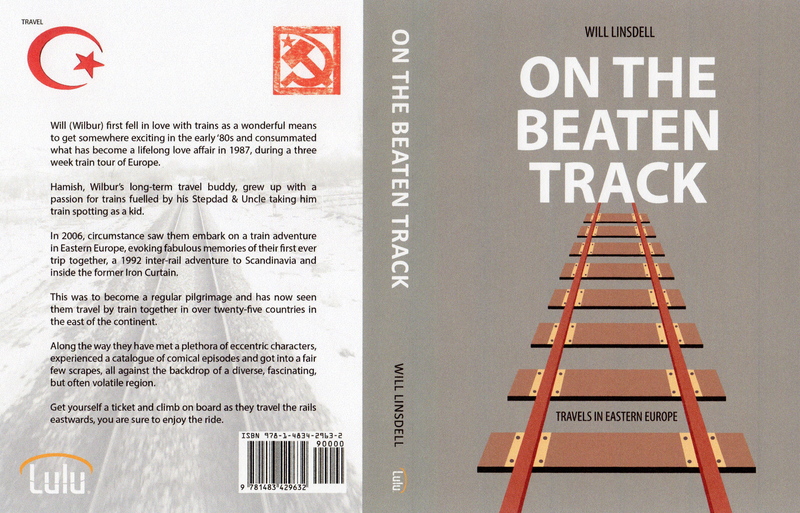 You can read about my 15,568 km of travels east by train in Europe by downloading my ebook from Amazon. Just click on the image of the book on the top right of this site. Once on a night train in Vietnam one of my fellow passengers (hard sleeper class) was a small, frail, elderly woman. She had the Engligh speaking student who was talking to me be sure to tell me that she had been an anti-aircraft gunner in Hanoi during the “American” war. But for real chaos and color you need Indian train stations…. It’s great to hear stories like that. I have only been on one Indian train and loved it. Indonesia was a fun experience too. Reblogged this on Wilbur's Travels. Great posts! I’ve done overnighters in the US, Malaysia to Thailand, Vietnam, China, Mongolia and Russia. And my profile pic for commenting on WordPress posts is from a train in Indonesia! Those compartments off a corridor were certainly the best! I too love those enclosed compartments. I never watched Reginald Perrin but remember them as a kid on our line into London. I have never noticed a wheel tapper but am off to Armenia in a couple of months so I’ll look out for them. Thanks for this really interesting post, one of my favourites to date. You will really love Armenia. Thanks for the comment. Oh yes, and for slow train travel with the doors open through the tea terraces, you can’t beat Sri Lanka. If you’ve never been, have a read on my blog – I wrote a beginners’ guide. I will take a look, would love to go.